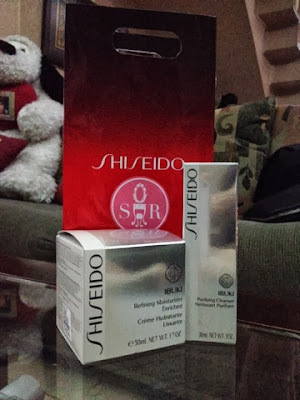 Shiseido Ibuki from Sample Room | Vanity and Everything in Between. First and foremost, I would like to thank Sample Room for giving me full sized products of the Shiseido Ibuki! Full sizes! Oh my! I can't even imagine buying skincare products from Shiseido because it's too expensive! Thank god, I no longer need to buy! I find it funny how I spend thousands for makeup and yet I can't even digest to spend thousands on skin care. What a bad habit. 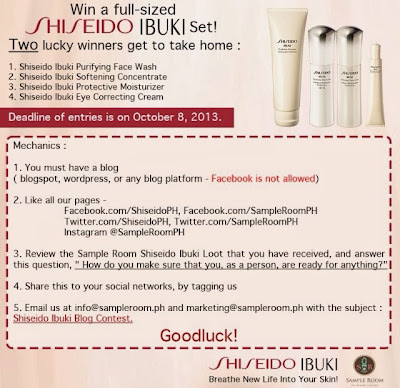 But anyway, click read more to see how you can get full sized products of Shiseido Ibuki for FREE! My favorite among the Shiseido Ibuki products is the Purifying cleanser and I'm glad I have a full sized product of it courtesy of Sample Room. It has microbeads that deep cleansing but the beads are gentle that they do not feel harsh on your face once rubbed against your skin. Also, you are getting your money's worth with the Purifying cleanser because it is advisable to use it once a week only! As for the Refining Moisturizer, you only use it at night! If you'd like to get full-sized products of Shiseido Ibuki, please look and read the image from Sample Room! If you are a member of Sample Room, you can also get the Shiseido Ibuki products by using your points! I'm just not sure if they're also full-sized. But hey, at least you still get it for free, right?! Good luck everyone!